Super cozy and cute and in the perfect location! This great Savannah vacation rental has everything you need to stay for a week or a month! Walk Everywhere, See Everything, Do Everything should be the name of this awesome property deep in the Historic District. Savannah is one of the oldest cities in the South and certainly one of the most beautiful. Walking along the famed River Street in the Savannah GA historic district, reminds you of a time long past, a time of beauty, softness and certainly a more relaxing lifestyle. Savannah is just one of those places you need to visit; walk along the streets; sit in the outdoor cafes; stroll through the art galleries and visit the theater in the evening. But getting into the spirit of Savannah can be a bit difficult, especially when you stay in a conventional hotel room. You just don’t experience that southern elegance, the charm and the grandeur of this fabulous city; not unless you stay in one of the more traditional savannah ga historic district homes. The Grey Pearl is just such a home. This is one of the Savannah GA vacation rentals that epitomize this southern style and look. Best of all, this one bedroom, one bath home is located just a block away from River Street, a feature very few Savannah vacation rental companies can offer. While staying in this gorgeous Savannah downtown home you can easily stroll along River Street, enjoying the glittering night life, shops and galleries. Admire the once prominent century old cotton warehouses, businesses and homes, now turned into antique shops, boutiques, restaurants, night venues and galleries. Head over to the quaint brew pubs and fabulous restaurants. Finally walk a few blocks back to one of the most comfortable Savannah ga vacation rentals, the Grey Pearl. This is a soft, elegant and luxurious one bedroom home that isn't offered by any other Savannah vacation rental companies. Located just one block from the opulent River Street, this is one of the Savannah GA vacation rentals that offers convenient location,and rich and tasteful accommodations. It’s only by staying in a gracious and tastefully decorated vacation home that you really get an understanding of what Savannah is like. Walk out your door, turn left and you’ll be able to indulge your every craving at an endless array of restaurants on River street and the surrounding savannah downtown area. This is a rental that most other savannah vacation rental companies can only dream of managing. Not only is it very tastefully designed, well appointed, and spacious, but the very best attribute of this, compared to other Savannah GA vacation rentals, is its fabulous location. 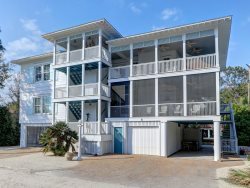 Although, a vacation rental with parking space, this is a place that puts you, your family and your friends within short walking distances of all the major attractions of this city known as the perfect southern host. This superb one bedroom charming home located within the Savannah GA historic district, has absolutely every amenity you could ever wish for, including luxury private parking. The chic styling offers the perfect combination of old-world elegance and polished modern good looks. It is a savannah downtown home you’ll be hard pressed to find with any of the other savannah vacation rental companies. This is the vacation rental that embraces you with its posh, beautiful furnishings and décor; the perfect place to spend a quiet night at home or even cook a fabulously romantic meal; it could even be inspired by southern cooking experts. Everything from granite countertops, modern wood cabinets and even a gas burning stove and in-house washer and dryer are available here. After a long day of sightseeing, nothing is as appetizing as being embraced by a gorgeous bedroom, queen sized bed, and flat screen TV. And let’s not forget the full bathroom with stand-up shower and large tub. This is much more than what you could ever get in a conventional hotel room, no matter how luxurious it is. At Southern Bell, service is our strength and we offer some of the most attractive Savannah GA vacation rentals in the city.Southern hospitality is our primary focus, and you’ll find that we have this trait in abundance, much more so than any of the other savannah vacation rental companies in town. Renting homes from Southern Belle is painless and professional. We take credit cards and require a $300.00 deposit to confirm the booking which is applied towards the remaining balance. For example, if your total is $1,000, we will take a $300 deposit and your remaining balance will be $700. Thirty days prior to your arrival our booking software will charge the balance automatically. We also sell Traveler's Insurance which covers medical cancelations. If you have any questions, please feel free to give us a call. Thanks so much for looking. Our experience has been the most simple and hassle free of any other vacation rental agency we have dealt with. Thank You! Gray Pearl was well decorated, classy, and parking was great. The foyer entrance smells a bit, you can hear the neighbors in the building and the location is on the edge of town, but I understood the location when booking and chose that intentionally just to change it up a bit. Beautiful property ideally located to historic and river districts. Our stay at the Grey Pearl was amazing! The entire apartment was beautiful and very comfortable. Trash/recycle was easy because containers were right there. I did not want ro leave and jope to return soon. It was a wonderful trip and a great location. Very friendly service, good email reminders of check in and confirmations. This was our very first run at a VRBO property. We were very pleasantly surprised! Will definitely use your service again! Staff were very helpful and easy to work with. The rental was beautiful, kept up nicely, and worth the money. The location was also great. The team was very great to work with and accommodating. We absolutely loved the property. We came to Savannah on vacation and we truly loved the property and the time we spent in the city. We have decided that we will be returning next year on vacation and plan to use Southern Belle Vacation Rentals again. Everyone has been helpful, friendly, and accommodating. Thank you for making our vacation a great one! We enjoyed walking the river every evening and loved the neighborhoods we stayed within. Thank you for a great vacation! Staying at Grey Pearl was wonderful. It was perfectly appointed, absolutely beautiful, and comfortable. The kitchen had everything we could need if we were staying longer and planning on cooking. (We only made breakfast). Very friendly and helpful to make it easy to rent and check in. It was very nice. We would stay there again. Nice people and very courteous. Very nice property. Would stay there again. Loved everything and we will never stay in a hotel again in Savannah now. Everyone we've spoken to has been extremely friendly and helpful. We have previously stayed in the East Jones Carriage House and the Grey Pearl didn't disappoint. We're going to try to book the same place at the same time for next year!